Randy Gilson is taunting me on his hand-painted purple, yellow, and green front porch. "Na na na na na na, you are a thumbprint. Na na na na na na, I am a thumbprint,” the artist chants like a playground bully, transmuting the melody to an ode to individuality. He couldn’t be less menacing in his rainbow, paint-covered outfit. Randy (he prefers Randy to 'Mr. 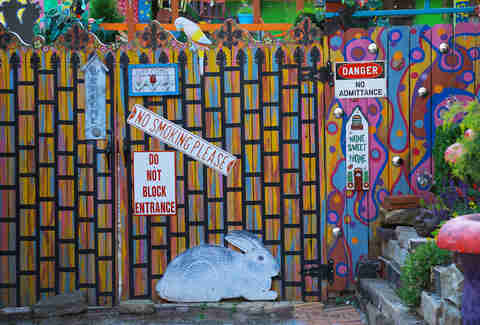 Gilson') is the visionary behind Randyland, the wonderland of found objects and original paintings at the corner of Jacksonia and Arch in the Northside. 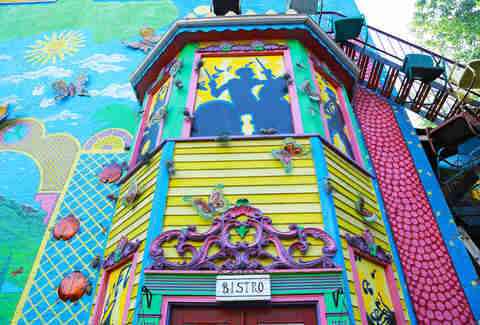 The murals, like Randy’s splattered ensemble, include every color of the rainbow and depict whimsical scenes like a curving road leading to a sunny sky full of enormous butterflies and a full wall of Welcomes in dozens of languages painted on to the buildings and fences lining the perimeter of the lot. Objects like a neon-painted guard lion, plastic garden swans, tiki torches, and a red suit of armor are carefully placed throughout the center courtyard. 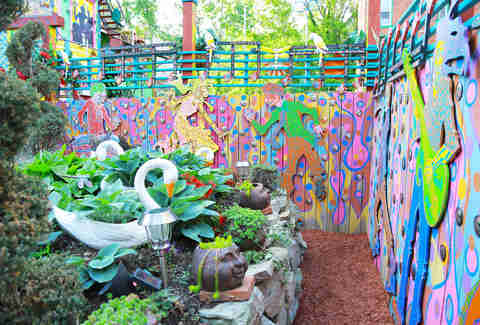 Opened more than 20 years ago, Randyland is a community landmark, a beacon, that has seen and led two decades of neighborhood change. "I took this empty building and made it a happy house," says Randy. "A voice, a heart for the community, for revitalization, for diversity, for unity." He pauses. "I didn’t know it was going to be this good." Everyone may be a thumbprint, but Randy has left his mark. If you don’t know Randy, there is a solid possibility you’ve never stepped foot on Jacksonia St. When outdoors, the artist extends every passerby an unself-conscious greeting. On my evening visit, his train of thought is interrupted a handful of times to call to neighbors by name and ask about their days. "A lot of people could pass each other daily without ever knowing each other," he says to me. He makes it his mission for that to not happen on his corner. 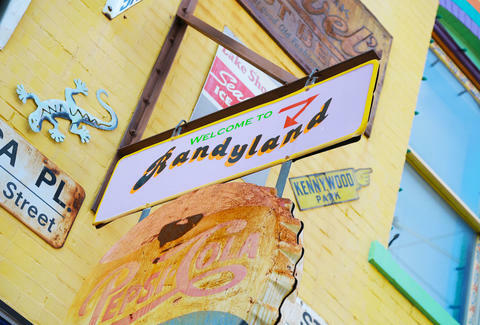 Randy started his personal introductions to his neighbors in the early '80s, a decade before he purchased the property that would become Randyland. The streets were riddled with empty lots, and cleaning them up became his priority. Every day, when the sun went down, he’d go out to tidy up the green spaces, collect building supplies, and meet people. "At first, no one would talk to me. They thought I was nuts," he recalls. It would be easy to assume as much of a guy sorting trash at night. But this was passion. Randy learned from his mother at an early age that giving back all you can is not a luxury, but a necessity. His family was homeless three times. He was on welfare until he was 26. Even still, his mother would invite women from the local shelter over for holidays and make sure they had a seat at the family’s table. Cleaning up his streets started as an act of giving back. His persistence in do-gooding began to tear away the community’s reticence about his character. "If we clean up, we are helping our parents, our friends, our neighborhood." Local children started to assist with the creation of hundreds of gardens in the Northside neighborhood -- gardens that he would turn over to the community once they were finished. Money to clean up the lots came from Randy’s own pocket, with partial assistance from the Western Pennsylvania Conservancy. "The kids would introduce me to parents and grandparents as ‘the guy who’s making the Northside nice,'" Randy says. "And when those adults would ask, ‘Who is Mr. Randy?’ the kids would answer, ‘Mr. Randy is our friend.'" Randy is a fountain of motivational phrases and encouragement. A moment of conversation is akin to walking into a room filled with hundreds of posters of kittens in mugs promising "You Can Do It" and "All You Need Is Love." The default is to roll eyes at those smug kittens, but it's harder not to take Randy seriously. He is genuine. When he says "you have to dream every day, every second of your life," he makes you want to dream. In 1995, after building gardens for more than a decade, he received a phone call about a house scheduled for demolition. The house had been abandoned. Like many other buildings in the neighborhood, tearing it down seemed an easy fix. But Randy felt compelled to preserve it. "Pittsburgh’s history is very valuable." As a waiter at a local Pittsburgh hotel, Randy’s resources were thin ($500 cash and a $10,000 credit limit), but he began the process of buying the property anyway. Eventually, this to-be-demolished lot became his own. With years of creating gardens from found material under his belt, he applied this working philosophy of sourcing and using what he finds to create an ever-evolving art experience. He first had to rehab the existing structure to bring it up to a livable standard. 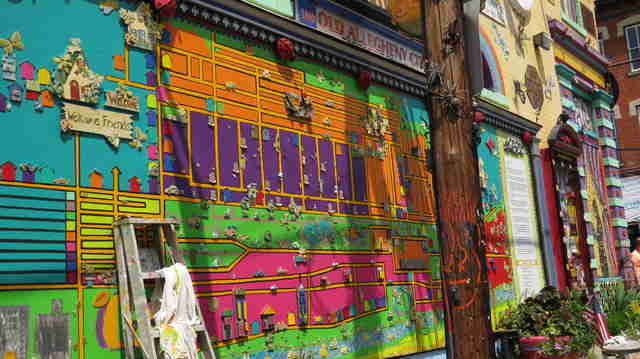 Then, the exterior got coats of recycled paint, covering every square inch of available wall space. And 20 years later, the property still continues to change and receive enhancements, maintaining its status as a Pittsburgh gem. 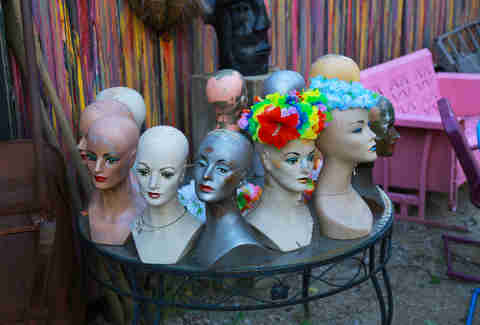 Along with the collection of Randy’s personal art, like his paintings of expressive faces he dubbed the “Thinkerers” and “treasures” that came from empty, torn down homes or found on the street, Randy himself is often a fixture in the yard and on the street just outside the tall fence, eager to engage with visitors. 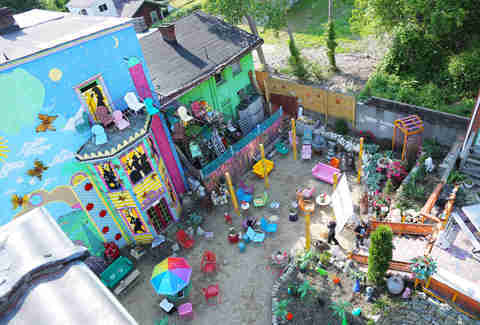 And like Randyland itself, he is the face of joy in Pittsburgh. "I was taught to give what I can to the world, and I just can’t get it out of me!" Randy exclaims. “I OD’ed on love! I can’t stop love! Love is free!" 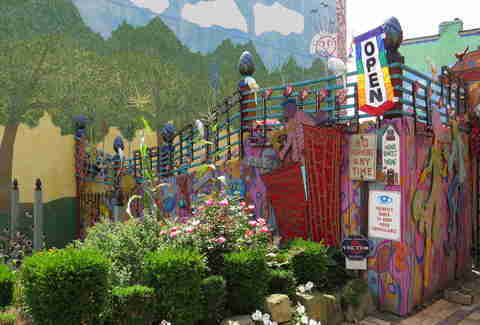 A visit to Randyland is also free, and it’s a gift and a symbol of positive community action and rejuvenation in the form of a colorful imprint on our Steel City. And that's a whole lot to love. Laura Zorch snapped her engagement photos at Randyland because she and her boo really felt the love. Follow her @lzorch.